Cross-posted on the Prosperity Watch platform. As North Carolina’s young people head back to school this week, it is their increased educational attainment that has the greatest potential to not only generate improved earnings and provide some protection against the worst employment outcomes their lifetime but also strengthen the state’s overall economic recovery and economy. 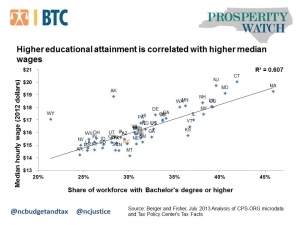 States with higher educational attainment not only have higher productivity but higher median wages. The increases in production of goods and services benefit the median worker in these states. That is a welcome outcome in light of national trends and what is happening in North Carolina. For the past thirty years, as the economy has become more productive, wages for the average worker have actually stagnated. In North Carolina, particularly in the most recent post-recession period, wages have actually fallen despite productivity growth. Jobs without good wages, increased productivity without wage growth are not the markers of a successful economy. States have a unique opportunity to pursue an economic development strategy through education that is focused on increasing the wages of the median worker in the state and thus improving their well-being. Investments in education are the key place to start. Adequate investments, that meet the growing demand of an increased student population, the changing needs of that population, and the expanding knowledge base needed to succeed in a 21st century economy, must be the foundation. Spending on what we know works will be key: professional development for teachers and pay that attracts and supports quality educators, instructional supplies and supports for students in the form of nurses and counselors. States can increase the strength of their economies and their ability to grow and attract high-wage employers by investing in education and increasing the number of well-educated workers. A tax cut approach to economic growth, however, undermines the ability of a state to make the investments necessary to build a quality education system from early childhood to post-secondary and beyond. North Carolina knows how to grow our economy through educational attainment, it just needs a state level commitment to move this agenda forward and do so with an eye to ensuring all students regardless of where they live or what age they are benefit.